Peter Mason grew up in Detroit, Michigan, and currently lives in Richmond, Virginia. His travels working in marketing and sales have taken him all around the country, and he has lived in an array of places in-between. He is a man with an abundant, dry sense of humor, and seems to relish in all that he does. After his career working in the business world, he has found writing to be his channel for his bountiful enjoyment of life’s pleasures. Mason points out that this is not a book that is trying to convey a philosophical message, but a book about entertainment and character development. This is not to say that it is devoid of meaning, just that it is supposed to be fun and enjoyable. The main character, Charlie Leuven is a charismatic business rogue notorious for manufacturing opportunities and taking advantage of them for his own benefit. His romantic interest in the female lead, Samantha Hewitt complicates things, and creates more challenges between him and his goals. Heroes of the 21st Century contains a plethora of unexpected and disparate elements—utilizing fear as a means of launching the book into its tumultuous fray. Whether it is fear of a political turmoil, or fear of the next big, apocalyptic, animal-themed flu, we live in a culture driven by fear. But fear is not what this book is about. It is an adventure in the cutthroat world of business. It is a romance between characters in extraordinary circumstances. It is a dark comedy about “making it,” but not too dark. The story is a reaction to the media and how everything is taken so seriously. It is the super serious portrayal of these concerns that he is addressing. In Mason’s own personal perspective, yes, there are terrible things in the world, but it is our ability to laugh about them that lets us keep on going. People get caught up in these trends and lose perspective. His work aims to reflect this view. 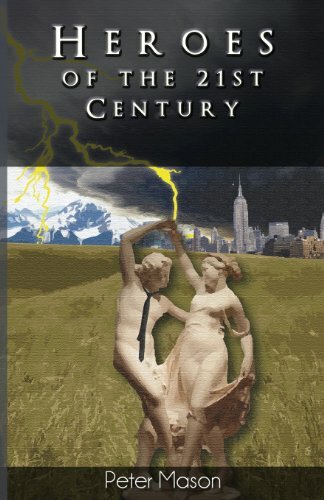 The paperback edition of Heroes of the 21st Century is now available on Amazon.com and will soon be available on Amazon Kindle and other eBook platforms. Contact Holon Publishing about ordering copies of Heroes of the 21st Century for your bookstore or business.